All is not so well within the elite’s New World Order. Their tried and true template of Problem-Reaction-Solution is in full gear as chaos reigns throughout the globe, which is exactly how the globalists like to see events unfold. Chaos [Problem] leads to unnerving situations [Reaction] amongst the masses that eventually cry out for resolve and a return to “normalcy” [Solution, but only as intended by the elites]. Invariably, a return to some kind of order requires the giving up of freedoms, and it often entails tightening the noose of economic hardship. Sadly, the rinse-and-repeat familiarity of this Problem-Reaction-Solution scenario never seems familiar to the masses. Each time is “different,” that is to say the events may seem to be different, but the procedure of how the events unfold each and every time throughout history is never different. The one invisible thread common to all events that has unfolded throughout history is actually not money but debt. Debt is the yolk which the globalists have forced upon the masses, originally, then to countries to get rid of individualism, sovereignty, national identity, even national borders. The EU is the present petri dish of how that works. What is Greece all about, Cyprus, Spain, Ireland, Portugal, and now creeping across all of the EU, South America, the US? In a word: debt. “You must borrow from us or we will bury your country by creating economic collapse,” says the BIS/IMF. The Maastricht Treaty was the blueprint for the European Union, and it ensured that all nations would become debt enslaved to that purely political alliance that had nothing to do with individual sovereignty, national identity, or borders. Over time, the intent of the debt-driven globalists was to build their NWO and destroy individualism in every way. No country within the EU is allowed to use their own banking system to fund any national projects. Everything has to be borrowed from the IMF, under their terms, and always to the advantage of the lenders and disadvantage to the borrowers. The Maastricht Treaty had its genesis in the Federal Reserve Act of December 23, 1913 in the United States. Eventually, through intended deceit, the foreign-owned, private corporation, known as the Federal Reserve, required all borrowing from the Fed, and in the process, the moneychangers destroyed the established independent banking system, even the independent United States Treasury. Nothing gets in the way of the elites. One of the underpinnings of the Fed is to ensure financial stability. Since its enactment in 1913, the value of a 1913 Federal Reserve “dollar” is now worth about 2 cents. How did that happen? The Fed transferred the wealth of the US, using debt, by steadily devaluing the currency through inflation. The beneficiaries of that transfer were the globalists, all at the expense of the American public, industry, and commercial viability. This is why we keep saying the US has become a hallowed out nation, gasping on fiat fumes which will eventually become highly combustible. A recent example is Barrack Obama, the president of the corporation known as the federal government. Obama represents the interests of the globalists and not the interests of the American people, as almost all Americans otherwise believe. His platform while running for the office of president was to cut the national debt in half. “Yes we can!” was his anthem but the “we” part of it referred to the globalists and not the American public. Did he cut the debt in half as promised if “elected,” [if voting actually mattered, it would be outlawed, so voting is mere globalist Bread and Circuses to appease the masses]. No, he did not. Instead, he has been running $trillion dollar deficits burying the country, actually the people because people are responsible for the debt per the 14th Amendment, in a downward spiral of debt from which the country people will never recover. much of it in the form of terrorism and the destabilization of the Middle East, now [intended] spreading the specter of terrorism throughout Europe. The biggest terrorist nation? By far, the corporate United States. The biggest individual terrorist? By default, George Soros and others of his ilk, at least in our opinion. Anyone who takes the time to connect the dots, which is easier and easier to do these days, cannot arrive at a different conclusion, at least not if you care about your independence and the protection of your family and way of life. The world is addicted to debt in the same way an addict is addicted to crack. Like any addict, none are willing to admit they have a problem, they can stop at any time is the pat response. It never happens. Their situation gets worse. People, today, are scared. They do not know how to escape from the globalist’s designed yolk of debt that becomes overly burdensome, even inescapable. The answer? Stop! Stop using! People see addicts as losers who made the wrong choices. They do not see themselves as mirror debt-using addicts who require their debt fix or lose control. As with drug addicts, stopping is not easy. The same is true of debt addicts. The globalists have been exposed, the curtain has been turned back. Yes, it is always painful to break a habit. Face with the pain of stopping versus the easier fix of still using, more debt is the inevitable outcome. Get away from the elite debt dealers. Stop using their fiat drug. A bit extreme? Not really. The globalists want to enslave the world by drowning it in debt and making everyone dependent upon its use.. This is the goal of all political heads of state who are carrying out the orders of the globalists at the expense of those being so-called governed. This is why Roosevelt was forced to tell Americans that they had to turn in their gold. Gold represented independence from the government, and the elites would not stand for that. Turn in the gold and use fiat paper instead. After all, the paper substitute was “as good as gold,” or so the story went. More lies and deceit based on the Problem-Reaction-Solution globalist anthem. Get thee gold, and get thee silver, and get out of debt or suffer the intended consequences. The world debt situation worsens. It is, and it always has been a matter of time before this IMF house of fiat debt collapses, and collapse it will, as certain as the sun rises in the east and sets in the west. The time draws nearer and nearer to the inevitable. No one knows exactly how it will unfold and when, but the when factor is already underway, as a process. It is an evolving event, an inevitable event. Will it be a smooth transition? Where in the world today are events unfolding in a clam and smooth manner? To that answer, we say no, an easy call, unfortunately. Will it get ugly? Hope for the best and prepare for the worst, for the latter is more likely. Is knowledge power? It is useless unless it is put to purposeful use. Will the ultimate price rise be as shocking as many suggest? Yes, if you believe the debt situation is as shocking as it is. Gold and silver are finite. Fiat is infinite. When the infinite begins to chase the finite in more earnest, it is anyone’s guess as to how the valuing of gold and silver will unfold. Those who have placed their trust in the natural order of supply and demand will amply be rewarded once the unnatural forces of fiat evil lose their incestuous grip of faux, yet real, power. We start with silver because we continue to hold that silver will outperform gold during the next move higher in the PMs, over time. The base shown on the chart is substantial for supporting a considerable rise in price, and we project it to the 36.50 level. This presumes that a normal bull market unfolds. If economic collapse occurs, then hang on for price rises that few have ever experienced in this arena. 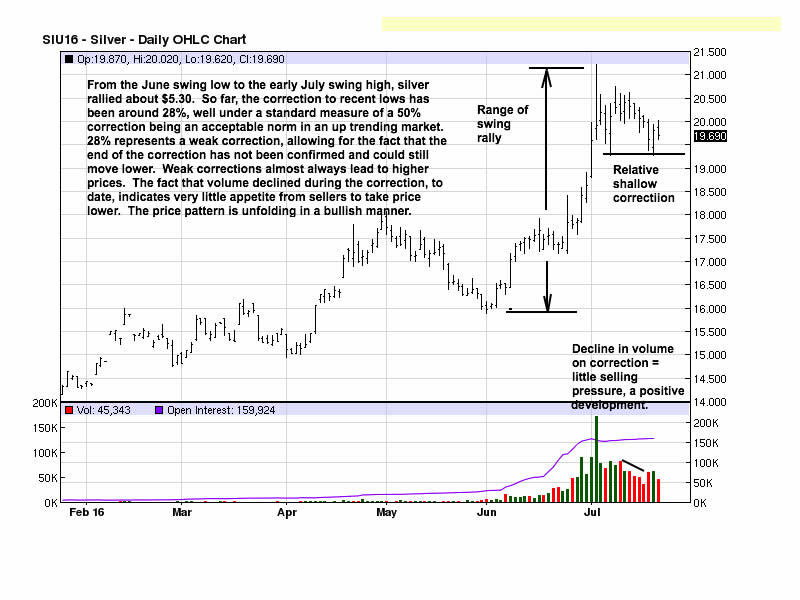 Using standard measures, we see silver unfolding in a positive manner. For as long as the BIS/IMF maintain a degree of supremacy, expect to see longer counter reactions to rallies. What becomes important is to determine the character of any reaction. The present one, as an example, is developing in a way that should lead to higher prices. Irrespective of any presumed market conditions that could take gold and silver to much higher levels, there still has to be confirmation that a correction has ended before the next leg higher can resume. The chart comments are apt. 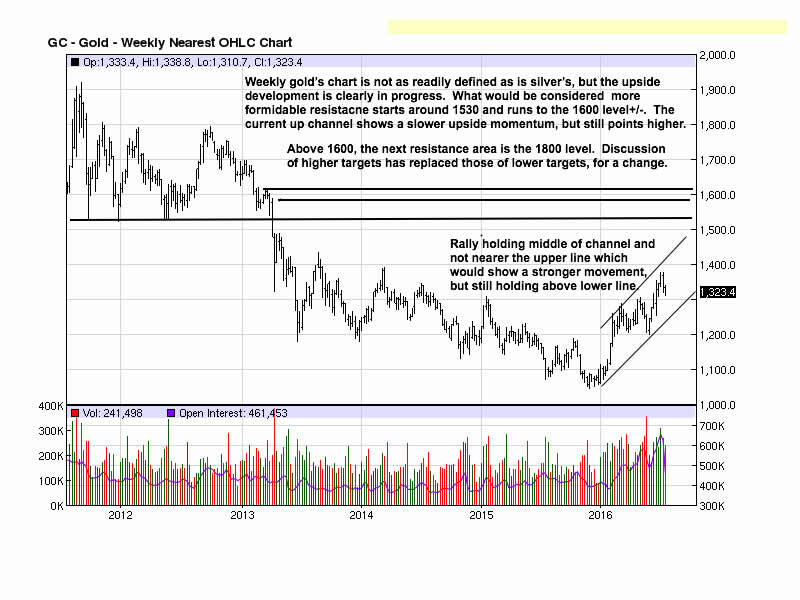 What we can add is how price is developing within the upward slanting channel. The upper line is supply, or resistance, and the lower line is demand, or support. Presently, price is working in the middle, as opposed to staying closer to the upper channel line which would indicate a stronger market. 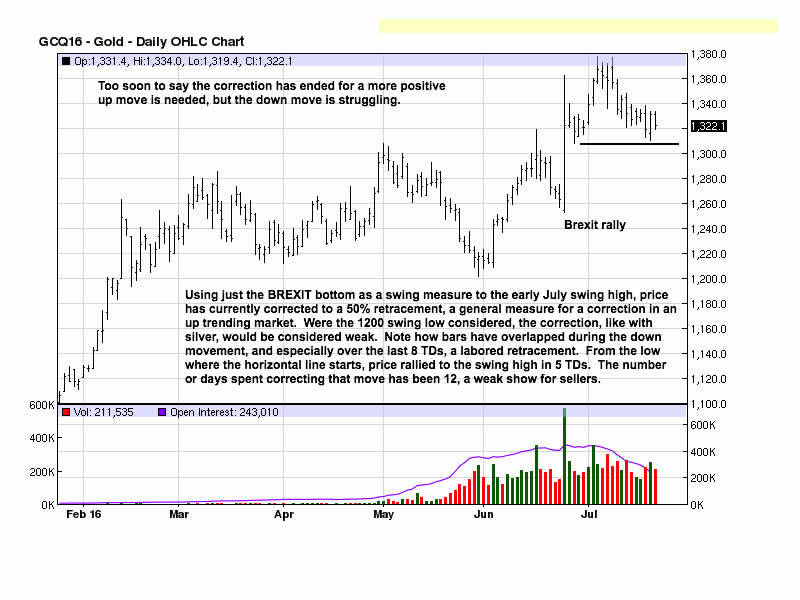 That price is still above the lower line tells us there is still a function of demand greater than supply. You can see the general similarities with the daily gold chart in that the reaction since the July swing high has been more labored to the downside, and support is holding well. If price does not rally away from perceived support, next week, it indicates acceptance at these lower levels, and price will go lower to uncover greater demand to eventually move gold higher. Keep buying and holding physical gold and silver. We continue to favor silver more than gold, at this point. 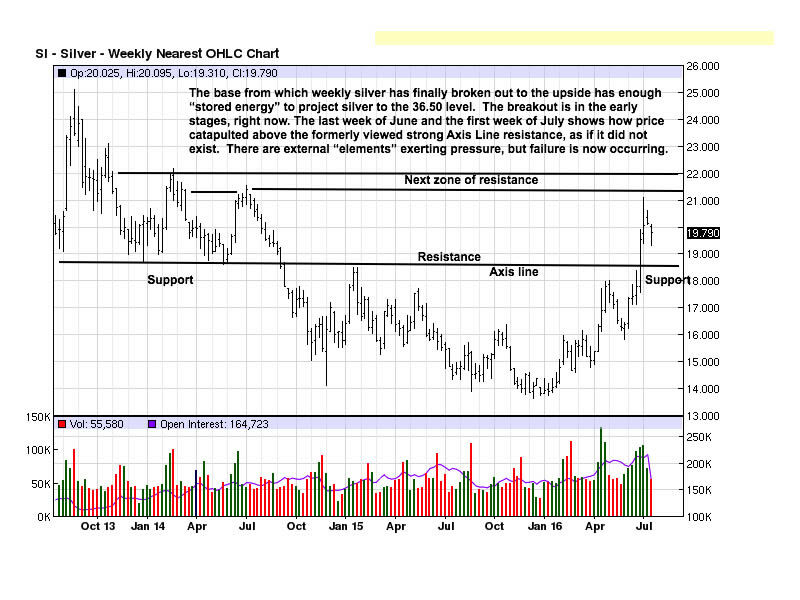 While both will move higher, silver will outperform gold to the upside yielding a better return. © 2016 Copyright Michael Noonan - All Rights Reserved Disclaimer: The above is a matter of opinion provided for general information purposes only and is not intended as investment advice. Information and analysis above are derived from sources and utilising methods believed to be reliable, but we cannot accept responsibility for any losses you may incur as a result of this analysis. Individuals should consult with their personal financial advisors.